With a combined total of over 50 years’ experience in providing Long-Term Services and Supports (LTSS), Monarch’s Best Practice team works diligently to ensure the people we support are receiving exceptional care. Through site visits and reviews, the Best Practice team offers guidance to LTSS staff across the state. The three-member team consists of Director Jennifer Smith; Team Member I Jerome Conner; and Team Member III Cornelius Powe. The Best Practice team relies on each other in combination with their individual professional experience to confirm that staff are meeting Medicaid-mandated and company policies. “Our most important core duty would be the peer reviews for the LTSS sites across the state,” Smith explained, adding that the team reviews and evaluates the records of the people we support for accuracy and quality. The team’s second core responsibility incorporates oversight of 16 Intermediate Care Facilities (ICF), eight in the east and eight in the west regions of North Carolina. Smith, with over 20 years of LTSS residential experience, noted that each team member previously held a qualified professional (QP) role within Monarch, which helps in evaluating sites through the lens of a manager. During their on-site visits, the Best Practice team reviews, records and assesses how the residential staff members interact and care for residents, suggesting ways they can improve. “We are there for them to provide any additional support after their review or mock surveys,” Smith pointed out, adding that sites are notified of a Best Practice review about two to three weeks prior to the visit. Since this year marks the third year the Best Practice team has been traveling and surveying together, Monarch staff have become familiar with them and, in turn, not uncomfortable when they arrive. Conner shared a residential location’s challenging experience of caring for residents who each presented unique challenges due to autism spectrum disorder diagnoses. “We put a plan together and a number of resources in place and it helped the residents of the home dramatically. Now, you see the connection between the staff and the residents. They feel loved – steady and consistent, and it is working,” he remarked. Powe enjoys the professional challenge of his role on the Best Practice team. “As a residential manager I was limited as to how many people we support I could affect. I could only assist so many people at one site. When we go out as a Best Practice team, I have the opportunity to help that leader’s case load and other sites as well,” he explained. The Best Practice team sets their team goals through comparing reports to identify where improvement has been made, as well as meet for quarterly peer reviews and roundtable discussions. The Best Practice team is critical to recording and reporting the quality of care. How the people we support are thriving goes beyond what is documented. “It is nice to know that you are making a difference. When everything is connected for the people we support. This is a job that at the end of the day what you have done is worthwhile,” Conner expressed. 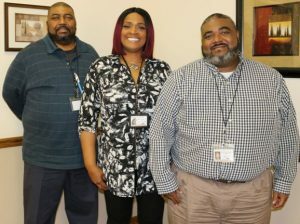 Photo caption: Monarch’s Best Practice team consists of, center, Jennifer Smith and, Best Practice Team Members, left, Jerome Conner and, right, Cornelius Powe.